The Hollywood 24 Hour Miracle Diet® makes doing a juice cleanse the right way easy and hassle free—everything you need is in the bottle! Juice is easier for your stomach to digest than whole foods—which means you can get more out of smaller amounts. By putting less in, you’re eliminating excess calories without depriving yourself of the good stuff your body needs, like vitamins, minerals, and other essential micronutrients. In fact, the Hollywood 24 Miracle Diet® is packed with essentials like Vitamins C, D, E, B3, B6, B2, B12, folic acid, and more. Plus The Hollywood 24 Hour Miracle Diet® includes two well-known “superfoods” Acai and Garcinia Cambogia! On the other hand, Garcinia Cambogia contains hydroxycitric acid, a byproduct of citric acid, which may minimize weight gain by blocking the metabolism of excess calories and carbohydrates into fat. But how about the taste? 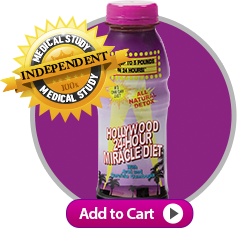 The Hollywood 24 Hour Miracle Diet® is a tasty blend of multiple fruit juices including apple, raspberry, cranberry, blueberry, blackberry, and strawberry. It sure beats a kale smoothie when you’re craving something just a little sweet. “When I add crushed ice to the Hollywood miracle diet it tastes and makes me feel like a million dollars! As I drink it, the sweet juice doesn’t taste like your typical diet drink. The 24 hour bottle is the perfect solution. I want a new body for Christmas and this product is giving me the kick start I need! Keep making this!! !” – Mary P.
A trial separation can be a good thing! By giving yourself a break from food—even for just 24 hours—you can begin to restructure your personal relationship with it. That break can be the mental first step you need to take in order to curb the cravings and the reliance on unhealthy snacks. Part of the change is mental but most people on juice diets find themselves feeling physically invigorated (because of those essential nutrients and proper hydration) which makes sustaining that positive change much easier. “I’ve used the 24 Hour Miracle Diet drink as a body cleansing product and it is fantastic! I’ve tried all sorts of cleansing products, and with 24 Hour Miracle, my digestive system feels the best it has in months! I lose fat mass, my thinking is clearer, and I feel like I have more energy. I use it every month to cleanse my system and jump start my diet. It really works great!! !” – Irene V.
A complete juice cleanse can actually help reset your body’s internal chemistry and may have wide-ranging effects on your mental capacities. In fact, many avid juicers report being more mentally “awake,” sharper, and experience fewer memory issues. Would you like to lose up to 5 pounds in just 24 hours? How about purging built up waste and toxins from your body at the same time? If so, it’s time to start your juice cleanse. Learn how The Hollywood 24 Hour Miracle Diet® can help you live lighter in just one day.